Single-pass printers are coming online that can print up to 70 meters (m) per minute or more, which is gaining the attention of many traditional high-volume rotary screen printers. Printed textiles are used in a wide range of applications, the most common being apparel, carpets, bed linens, curtains and upholstery. Inkjet printing garnered some excitement in its infancy, but its low production speeds and restrictions on the types of fibers that could be printed were major limitations. Early speeds of 150 m2/hour (hr) were only good for sampling or very short production runs, and it was well below the speed requirements for high-volume production applications like fashion apparel or home furnishings. However, the textile industry is currently witnessing incredible advancements with the introduction of several unique, high-volume inkjet printing systems. Until recently, textile yardage was printed mainly by rotary screen or flat screen, each having great volume throughput capacity, but with limitations on the maximum image size. Inkjet printing allows for greater flexibility in the printing process, and freedom from pattern repeats (the maximum image size achievable with rotary or flat screen printing). The largest rotary screens have a circumference of approximately 40 inches (in), therefore the maximum repeat size of the pattern is about 40 in. The same is true for flat screen printing; the image size is limited by the frame size. Neither of these factors are at play with digital inkjet printing. To this point, the technology has been too slow to garner interest and adoption by the high-volume printers - but all that has changed. There are four major textile ink chemistries used in digital inkjet printers: acid, reactive, pigment and two flavors of disperse dye (direct disperse and dye sub transfer). 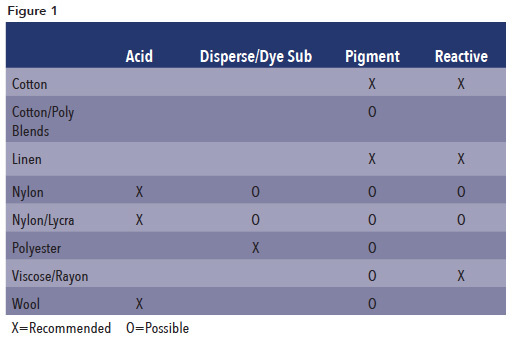 All of these are combinations of water, the dye or pigment, humectants to retain moisture, viscosity/rheology modifiers to control flow, dispersants to keep the dye or pigment suspended in the fluid, surfactants that lower the surface tension of the ink, and antimicrobial agents to control microbial growth. For some pigment inks, a binder (resin) is also included that essentially "glues" the ink to the fabric. Each of these has an affinity to specific fiber types (see Figure 1), and each chemistry comes with its own benefits and limitations. Acid dyes are composed of organic acids (sodium or ammonium) that have an affinity for protein fibers like silk, wool, alpaca and mohair. Acid dyes work with nylon but not with any other synthetic fibers. They produce very bright colors, and have exceptional lightfastness and washability that is ideal for applications like flags, neckties and scarves. The fabric must be pretreated with an acid, urea and anti-migrant agents, and must be steamed for 20-40 minutes. Following steaming, the fabric is washed and dried. Popular acid dye printers include the StampJet by DigiFab*, Nassenger by Konica Minolta, DIVA by Expand Systems*, and the 1628TD and 2628TD models from Mutoh*. Reactive dyes are the most used method for the coloration of cellulosic fibers (cotton, rayon, hemp, linen, bamboo). Reactive dyeing is used in batch dyeing for many of the colored T-shirts available to consumers. Reactive dyes provide high crock resistance, lightfastness and have excellent washfastness, which is a main reason for their use in apparel and home furnishing applications. As with acid dyes, fabric intended for printing with reactive dyes must be pretreated for digital printing with alkali (instead of acid), urea and anti-migrant agents, and must also be steamed for approximately 10-15 minutes or thermofixed at 325-350° F for 2-3 minutes after printing. Once fixation is completed, the fabric is washed and dried. Popular reactive dye printers include the TX500 from Mimaki*, the DIVA from Expand Systems, the Teleios Grande and Hexa models from d.gen*, the FD1908 and FD1904 models from DGI*, and the 1938TX model from Mutoh. Disperse dyes are limited to polyester fabric (and some nylon and nylon/lycra blends) and produce bright colors, although not as bright as acid or reactive dyes. Low-energy disperse dyes are commonly referred to as dye sublimation ink where the ink is printed to a transfer paper, which is married to the fabric in a heat press or rotary calender set to 380-410° F for 30-60 seconds. The heat and pressure cause the molecules of the polyester to open like a flower. The heat also causes the ink to transform from a solid to a gas and sublime into the polyester molecules that receive the gaseous dye. When the heat and pressure are removed, the polyester molecules close, trapping the dye within the fiber. Dye sublimation transfer has good lightfastness for indoor applications, but when exposed to outdoor conditions for extended periods, the dyes will fade in as little as 90 days. The most common applications for dye sublimation transfer are performance apparel, indoor banners/soft signage and many hard surface items which are treated with a polyester coating (mugs, plaques, mouse pads, metal, etc.). Dye sublimation transfer printers are available from many of the major wide-format inkjet manufacturers including Epson*, Mimaki, Mutoh, Roland DGA* and Sawgrass*. Direct disperse dyes are a high-energy version of dye sublimation transfer inks that are printed directly to a fabric that has been pretreated with anti-migrant agents. This treatment essentially keeps the ink in one place after its jetted onto the coating. Once the ink is dry, it is thermofixed at 400° F for 1-2 minutes or steamed at 350° F for 8-10 minutes. Direct disperse dye printers are available from ATPColor Srl, d.gen, DigiFab, Durst*, EFI*, Hollanders*, Mimaki, Mutoh and Expand Systems. Pigment inks can be used on the largest variety of fiber types provided the fabric has been coated for pigment inks, or the printer itself has onboard pretreatment of the fabric prior to printing. Once printed, heat fixation is required, but usually no washing is needed. Pigments have excellent lightfastness and washfastness provided the proper balance of pigment is used - too much pigment results in poor washfastness. Limitations of pigment inks include their narrow color space and crock fastness; however, inkjet pigments offer an advantage in that the ultraviolet resistance is higher. The printed fabric typically does not require post washing, which saves time, money and resources. Improvements in chemistry for colorants and pretreatments has resulted in larger color gamuts, improved hand of printed fabric and improved productivity. Pigment printers are available from d.gen, Expand Systems, Kornit*, MS Printing Solutions SRL, Mutoh and EFI Reggiani. Much of the excitement for digital textile printing centers on single-pass printers. This digital inkjet platform uses a fixed array of printheads that print as the fabric or media is fed beneath. They are significantly faster than scanning head inkjet printers that print by moving the printhead carriage back and forth, indexing the fabric after the head passes over. In single-pass printing, each printhead station jets one color - cyan, magenta, yellow or black (CMYK) - with the option on some machines to add up to four additional stations for colors like blue, green, red or orange. Single-pass printers are much larger than scanning head printers, but their speed justifies the large footprint that is required. MS Printing Solutions was first to market with the Lario, a single-pass printer designed for textile applications. The Lario can print at speeds of 75 linear m/minute (min) at 600 x 600 dpi in CMYK. When printing sublimation paper, the Lario reportedly can print at speeds over 100 m/min. The maximum printing width is 3,200 millimeters (mm). The Lario also has an open ink system which means virtually any acid, reactive, disperse or pigmented ink can be used if it is compatible with the printer's components. The Lario has a variable droplet range of 4-72 picoliters (pL). Konica Minolta's Nassenger SP-1 is another single-pass printer designed for textiles that accepts reactive or disperse dyes. It is available in four, six or eight color models, offering 1,600mm and 1,830mm width versions for each model. The SP-1 can print at speeds of up to 6,400 m2/hour with a maximum resolution of 720 x 900 dpi. The SP-1 accepts acid, reactive and disperse inks manufactured by Konica Minolta, and has a variable droplet size of 6-30 pL. SPGPrint's* Pike is also a singlepass inkjet printer designed for textiles. The six-color printer is compatible with acid, reactive and disperse inks, producing printing speeds of between 3-40 linear m/min. Each of the six color modules has a dedicated Archer(r) printhead array containing 43 printheads providing a maximum printing width of 1,850 mm. The printheads offer a native resolution of 1,200 x 1,200 dpi, with a variable droplet size range of 2-10 pL. The modular construction of the Pike allows models with up to nine colors. Wider versions of the Pike, up to 3.2 m, are planned. While increased production speeds have much of the attention of the textile world right now, development of printers for specialized markets are not to be overlooked. Grand-format sublimation, printers designed for sweaters, jeans and leather goods, and printers designed for carpet and fleece are just a few of the exciting developments. Grand-format inkjet printers have the capability of printing widths of up to 5 m. MS produces the JPK and Lario in a 3.2 m print capacity. EFI Reggiani makes the ReNoir printer in 1.8 m, 2.8 m and 3.4 m widths. Durst offers the Rhotex 500, the first 5m disperse dye printer designed for fabrics. The Allegro, from Israel-based Kornit Digital Ltd., uses a patented fixation technology where a pretreatment and seven-color set of Kornit's water-based NeoPigment(tm) inks are jetted through the printheads directly onto the fabric, eliminating pre- and post-treatment. The Allegro uses 64 Spectra Polaris printheads, and a sticky belt that syncs with an axial unwinding system, which has adjustable fabric width and tension mechanisms. With a printing width of 1,800 mm, the Allegro can print up to 200 m2/hr. J. Zimmer Maschinenbau GmbH offers the Coloris3 that has variable droplet sizes from 10-240 pL, which makes it ideal for printing fashion fabrics as well as fleece, towels and carpets when used with Zimmer's ChromoJET pretreatment and the SupraPRESS inline pretreatment application unit. Development of inkjet printing machines designed solely for textiles has now reached a level of speed and efficiency that easily meets the needs of the textile market. Single-pass printers offer speeds and prices that are very competitive with rotary screen printing. However, slower printer models may meet the needs of prototyping, sampling or shortruns. Research and development in technology have drastically improved printing costs and efficiency. We will continue to see advancements in variable drop printheads, fabric handling systems and fabric wrinkle detection systems, nozzle failure detection, and ink chemistry developments for increased color gamut sizes. Research and development will continue to focus on pre- and post-processing. Costs for single-pass digital inkjet are now nearly equal to rotary screen printing. Ink costs for digital printing are higher, which is to be expected; however, labor and energy costs can be lower. Other advantages of digital printing that should be considered include greater cost reduction for small run sizes versus the costs and make ready involved in engraving new rotary screens, not to mention the storage space they require if they are placed in inventory for future reruns. Digital printing also has less environmental impact compared to rotary screen, and there is higher uptime due to job changeover happening on the fly as opposed to changing out screens. The future is now for digital textile printing. The new single-pass printers are definite game changers, and the technology will set a precedent for the rest of the printing industry. No longer will large format, industrial applications be restrained by scanning heads. The initial attraction to digital was the ability to produce low-volume work at a reasonable cost. Now that print speeds are equal to that of high-volume analog, there will be lots of disruption not only in textiles, but in the entire printing industry. Crock Fastness: The resistance of transfer of colorant from the surface of a colored yarn or fabric to another surface, or to an adjacent area of the same fabric, principally by rubbing. For pigment especially, crock fastness is of concern. Pigment particles sit on top of the fibers held in place by a resin (the pretreatment). Crock fastness determines if there is acceptable rub resistance of the pigment to friction. Hand or Handfeel: This refers to how the print feels in your hand. Soft-hand means you can't feel the print; harsh (or hard) hand means you feel the print or the the print feels stiff/thick, etc. Urea: Also known as carbamide, urea is an organic compound used in textile dyeing. Johnny Shell has served as Vice President of Technical Services for SGIA for the past eighteen years. In this role, he directs and coordinates the activities of the Technical Services department and works to educate the industry on the capabilities and viability of specialty printing. Shell also teaches numerous workshops annually, and his technical writings appear regularly in several top industry publications in the US and abroad. He has worked in the specialty imaging industry for the past 30 years, with experience ranging from optical media manufacturing to graphic and apparel printing. He has won numerous printing awards throughout his career, and is a member of the Academy of Screen & Digital Printing Technology. This article appeared in the SGIA Winter 2017 - Journal Garment Edition and is reprinted with permission. Copyright 2017 Specialty Graphic Imaging Association (www.sgia.org). All Rights Reserved.